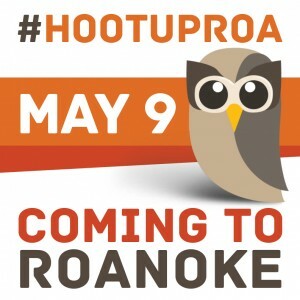 Hootsuite is coming to town with the first #HootUpROA, held at the Roanoke Higher Education Center. Our very own social media scientist, John Lusher has been working with Danielle Hatfield, a Hootsuite Envoy from North Carolina, to organize the event. The event is directed to those professionals and students in and around the Roanoke community who want to learn social media best practices using Hootsuite, one of the most popular social management tools. The event will be held Thursday, May 9 at 5:30 p.m., at the Roanoke Higher Education Center in Room 212. There will be limited seating to this free event but you will need to register to attend. Get your free tickets here. You can also check out the event on Facebook. John Lusher will be moderating a panel discussion. Panelists will be taking questions from attendees as well as their will be interactions from the Hootsuite staff. You will have a chance to mingle with the panelist during the networking portion of our event and Danielle will be on hand to interview attendees to discover how HootSuite helps them. Those interested in being interviewed be sure to sign up to be included in a video of #HootUpROA when you check in! And don’t leave with out getting your #HootKits! Follow each of the panelist on Twittter and if you have a question you want answered leave it in the comment section below. Attend #HootUpROA – Limited Space – Register Now! Remember if you have a question for the panel leave it in the comments below!! See you at the #HootUpROA! !